I saw the article on your website about the museum of old Yank cars in Bangkok. Can I please get the location of that? I'll be in Bangkok for a few more days and would like to see the place before I leave. It's in Lam Luk Ka North of Suvarnabhumi airport. I think the street was Soi Wat Adison, beside a builder's yard, definitely left turn off highway 3312, which you can reach by heading North on Highway 9 from the airport. The owner is P-PLOY YONT; he manager is Narong Poungpong. Telephone numbers are 0-2747-0670-1; 01-1991191; 01-9275028 and 0-2747-0671. You need to make an appointment or they may/may not let you in. Good luck. Compared to the same models in the USA, the cars are mostly fairly rotted out. 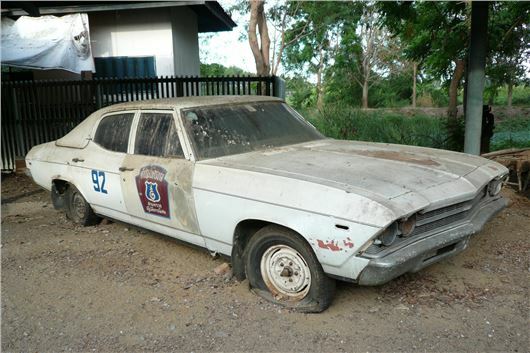 Two favourites were the ’63 Chevelle Royal Thai police cars. I have owned my 2004 Mercedes Benz C Class from new. In 2012 I had the passenger seat SRS indicator pad replaced, and it has just failed and been replaced again, at a cost if £320 each time. I have read that there are emulators available for about £15, which mimic the seat pad, but could they invalidate the insurance? Call in airbagman.co.uk/ If you had a crash that injured or killed the passenger, you'd still have passenger liability but your insurer might reclaim the payout from you. A colleague has just informed me that Jaguar has launched an SUV, do you have any observations regarding that car? Since owning an Audi A3 Sportback, bought new in Nov 2013, I have experienced a very poor gearbox. It is extremely notchy and particularly difficult, sometimes impossible to engage reverse. In my innocence I believed that the problem would alleviate itself after a bedding-in period. No such luck. Now that the 3-year warranty is expiring soon, I approached my dealer who has acknowledged a faulty gearbox. Emails back from Audi UK also note there is a problem. However, all they say, and I quote, is: “At the moment no effective repair is available. A solution is being prepared.” The engine on the A3 in question is a 1.4TSFI and the gearbox is a 6-speed manual. What is my situation now that the warranty is about to expire and how long do I wait for a solution? Part of the dispute that recently held up the manufacturer of VW Golfs and Passats was with ES Automobilguss, the differential casing manufacturer. These are the relevant recorded faults: 22-2-2014: Clutch failure of 2011 Passat 1.6 TDI at 27,000 miles. Replaced at cost of £800; 27-7-2015: Clutch of 2011 Passat, bought second-hand in 2014, failed at 24,400 miles. VW paid 70% of the cost. Apparently the dual mass flywheel was not replaced; 9-8-2015: 2012 Passat TDI showing "hot spots on flywheel and clutch plate" after 31,000 miles. Also engine suffering timing problems believed to be due to the flywheel: lot of stalling and varying revs. Reader believed DMF to be faulty, but might be a failing clutch slave cylinder; 28-3-2016: Manual transmission of 2012 VW Passat 1.6TDI bought used at 54k miles in May 2015 failed in October 2015 with loss of 2nd and 4th. Car out of VW used car warranty. No help from supplying dealer or from Volkswagen. Different, friendly VW dealer discounted cost of replacing transmission, clutch and DMF with new exchange unit to £2,552 and AA contributed £465 to this because of type of cover owner had; 16-8-2016: Report of failure of gearbox of 2012 B7 Passat 2.0TDI Bluemotion manual due to the flywheel damaging the transmission casing. I would like to customise the interior of my 2013 Auris Hybrid, Mk 2 by having a leather upgrade. This would mean replacing the half leather interior with a full leather one, which would include a colour contrast: nothing garish, you understand. I wouldn't be so crass as to ask you to comment on the particular company I'm thinking of using. However your opinion would be much appreciated on the exercise. This sort of thing usually costs around £1,000 using a local <car upholsterer and trimmer> (http://www.yell.com). A lot depends on the quality of leather. I've had two cars in Thailand with aftermarket grey leather fitted and in both of them it gradually turns a sort of green. I have owned my 2002/52 Jaguar X-Type 2.0 V6 Classic (petrol) from new. At 116,000 miles the condition can only be described as immaculate, with FSH, etc. Thankfully, it runs as well today as it did when purchased. Out of interest, I obtained a quote from ‘We Buy Any Car’, who offered to relieve me of it for the princely sum of £120 - and, no I haven't missed off a nought. I assume they are having a laugh and would appreciate your thoughts. In your opinion, are X-Types likely to increase in value over the next few years in line with experiences with Rover 75s? WBAC is part of British Car Auctions and simply bases its prices on what cars are fetching at BCA auctions. The biggest BCA centre in the country is just down the A30 from you at Blackbushe. Go and have a look. I don’t see Mondeo III based 2WD X-Types as potentially as ‘classic’ as the right Rover 75s. What are your thoughts on a Mercedes Benz SLC 200 Sport, base model. White or Fire Opal (red)? Should we go petrol or diesel? Auto or Manual? We only do 6,000-8,000 miles per year, as 2nd car. OTR is £30,450. I have been offered them at approximately £22,000 through DriveTheDeal or CarWow. Are these companies trustworthy? £22k is really cheap for an SLC. Get petrol. No point in a diesel for your low mileage and likely to be trouble. Manual for fun. Auto for town and for slopping about. Mercedes has had a bit of trouble with its red paint, so I’d go for white. DTD and CarWow very good. They broker deals between you and dealers. They do not supply the cars; the dealers do. extracted from ECUs and used both to make copy electronic keys and to start cars. The best protection is a Disklok. I see from your Tweet that the new Skoda Kodiaq comes with a DSG. I saw somewhere that Ford is giving up on Powershift boxes and going back to torque converters. True or false? My last Skoda DSG failed and the gearbox man says he sees countless dead VW DSG boxes. Comments? Ford has switched the Focus 1.0 and 1.5 petrol EcoBoosts and Kuga 1.5 EcoBoosts to 6-speed torque converter and the Tourneo Connect always was. Focus, C-Max and Kuga 2.0TDCIs remain Powershift. What VAG seems to be doing is abandoning its troublesome dry clutch transverse DSG and s-tronic and replacing it with a high torque (600Nm) 7-speed wet clutch DSG/s-tronic that is appearing in the Kodiak. I have driven it in the 480Nm Audi TTRS and can confirm is is a vast improvement. I guess they will also replace the 6-speed wet clutch DSG/s-tronic with the 7-speed wet clutch one. The longitudinal Audi 7-speed s-tronic in models like A4s, A6s, A8s, Q5s, Q7s and Macans remains, with improvements in next year's new Q5 and A5. Please can you give me some advice? I like the look of the new Hyundai Tucson, which has received some great reviews. I understand that SEAT has just launched a new SUV also, but the reviews do not seem so good. I do a lot of motorway driving and comfort and reliability are my main considerations. The Hyundai also has a brilliant warranty, which I know SEAT cannot compare with. I am leaning towards the Tucson, but do you think the SEAT warrants a closer look. You must mean the SEAT Ateca? It's a slightly smaller vehicle with engines from 1.0 to 2.0 litres whereas the Tucson starts with a 1.6 GDI petrol. I haven't driven either yet, but have driven the KIA Sportage that is mechanically identical to the Tucson but looks completely different. The 1.6T-GDI AWD is the best. But the 1.7CRDI is good for a different job because it has torque from a very low 1,250rpm. I will be driving the Ateca within the next month. Please could you recommend a few mid-priced 7-seaters that have the largest boots when all 7 seats are in use. I urgently need to get one for our growing family (buggies, shopping, suitcases, scooters etc. ), and wish to avoid the smaller versions that leave you with barely a boot when the 3rd row is in use. The cheapest really big one is the Ssangyong Turismo: /road-tests/ssangyong/ssangyong-turismo-22-elx-2016-road-test/ The 7-speed automatic ambles along pleasantly, but, of course, is no sportscar. I've just been testing the new mid-size Citroen Space Tourer, which is latest in the class and is excellent: /road-tests/citroen/citroen-space-tourer-business-2016-road-test/ (There are Peugeot Traveller and Toyota LiteAce Verso versions built alongside.) The new Mercedes Benz Vito 7-speed automatic is also good. Please can you help? My daughter has started a new job and has been given a new scooter to drive around London. The company has bought the scooter and paid for insurance, riding gear and driving tests. However, the scooter and insurance have been registered in her name. Does this mean she will be liable for any accident repairs etc? I am worried that the company are trying to pass the onus onto my daughter. Your comments would be appreciated. If it's comprehensive insurance then they have covered her. If it's third party, then someone would have to pay for any damage to the scooter. I bought a LandRover Discovery Sport new at the end of March 2016. Since I have had the car it’s been back to the dealer 4 times, total 11 days for vibrations from accelerator, steering column, drivers floorpan, centre console and centre armrest. I find vibrations annoying, and uncomfortable. (I had two operations on my feet in the past 2 years for nerve damage and am concerned this may trigger further problems.) Both local dealer and supplying dealer tell me that “It’s a characteristic of the new engine.” LR Customer Relations just keep referring me back to dealers. I have had two loan Disco Sports. One was almost as bad as mine; the other had almost no vibration. Please can you guide me as to what my next steps should be? Not happy that I have paid £41k+ for car that is annoying and causes discomfort. These are your rights: /faq/consumer-rights/ Whether a judge would accept that the vibration made the Ingenium diesel engined 4x4 "not of satisfactory standard" is another matter. The engine block itself widens at the bottom to help absorb vibration, so there may be a problem with the mounting bushes. I think you would need to provide proof that your Disco Sport vibrates more than other Disco Sports. My wife is very pleased with her Hyundai i10, which meets all the demands of her trips to the shops, golf club, hospital, etc. She now thinks that she would like to part-exchange it for an automatic version. Do you think such a move a wise one as we have been told that there have been problems with the Hyundai automatic gearbox? If not what small automatic run about would you recommend please? The Hyundai i10 and its sister car the KIA Picanto have 1.25 litre engines and are offered with a 4-speed torque converter automatic transmission that has been no trouble. However, she should learn to left foot brake the car so she can stop instantly, at least while manoeuvring, in order to remain in full control of the car. I have the opportunity to replace my 2004 Mk V Golf with a SEAT Leon ST SE from 2014 with the 2.0TDI engine, which is my preference as it is mostly for motorway journeys. A dealer is offering the car for £11.5k with 20k miles on the clock. Would you say this is a good deal? Or maybe “too good a deal? It's a SEAT dealer in Scotland. The car seems to get good reviews and my wife already has a Golf Mk VII 1.6TDI which I really like but since we are parents to a young one we need the extra boot space of a station wagon for when we travel on holiday, Christmas etc. Seems like a good deal. This will be the EA288 2.0TDI that is not the engine that had the emissions trouble and is, in fact, very low NOx. SEATs are easily as well built (perhaps better built) than Golfs. They just lack Golf 'quality' touches like velour lined gloveboxes and things like that. I have a Honda Insight, registered in March 2011, which has been serviced by Honda since I bought it new. It has done 30,000 miles and is still on its original brake pads, now about 30% worn. I suspect that I will need a new hybrid battery within the next couple of years. The car has been fine and I like it, however I am wondering whether to change it. My reasoning is that, after 6 years, while the engine, body etc. is fine I worry that modern vehicle electronics are not so reliable and tend to be costly to repair. Also, VED tax will change next April and I might take advantage of the lower tax for buying before then. What is the value of my insight and what would you recommend as a suitable replacement? I read most of your letters re parking fines but have never been involved myself. Today my wife received a request to pay a fine of £60 if paid now or £100 if not paid in 28 days. The incident beggars belief. My wife parked her car in a marked car park (2 hour limit) and visited Sainsburys Local, as she does each Saturday morning to pick up bread and papers. She spent approx 10mins there and returned to our home some 5 miles away. Today we received a letter from UKCPS (Leeds) claiming my wife was last observed in the car park at 13.50pm. This is completely untrue. Can you please tell me the best way to protest this false claim?